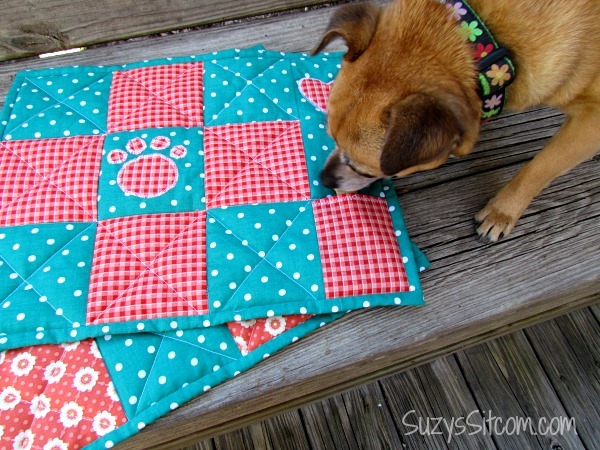 DIY Quilted Doggie Placemats and tasty nutrition for your dog! We are finalizing the move into our RV this week and after finally finding room for their Purina® Pro Plan® dry dog food, I realized that the dogs needed placemats under their dishes. Why? Well, for one it will keep the floor from getting messy, but the most important thing is everyone knows that dog food has much better taste when it is eaten over a rug. Since I want to save my new carpet, a quilted placemat is in order! 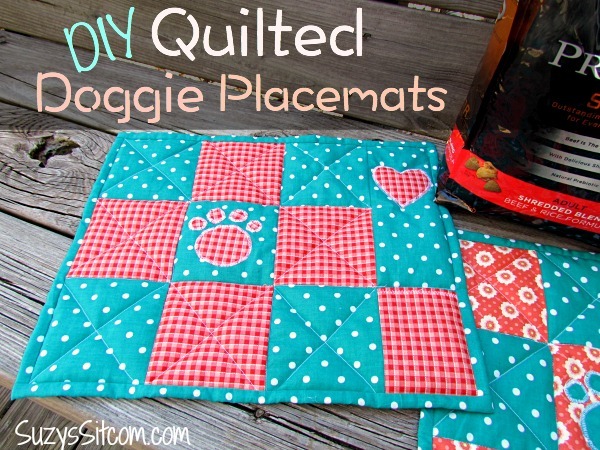 These quilted placemats are easy to make! And they have a little pocket on the side to put a treat in for dessert! 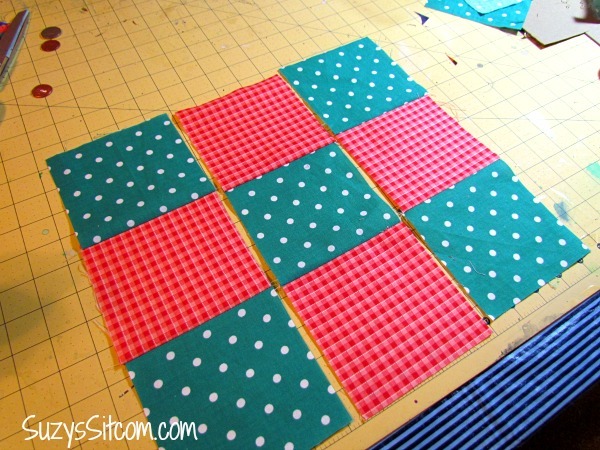 I love creating my own decor and since my motorhome will be featuring teal and red inside, these little placemats will work well! Faith seemed pretty impressed with them. But then again, maybe she was just wanting me to open that dog food bag. She is a big fan of Purina® Pro Plan® dry dog food. So am I, in fact. We looked high and low to find a brand that we trusted when it came to feeding the dogs. Purina® Pro Plan® dry dog food is the first brand to use and be founded on the idea of real meat as the number one ingredient to help promote total body health. Real chicken, beef, lamb, or salmon! Their goal is to give dogs the nutrition to be their absolute best, keeping them energetic and healthy. If you would like a cool rebate offer to try Purina® Pro Plan® for free, be sure to check the bottom of this post for details! 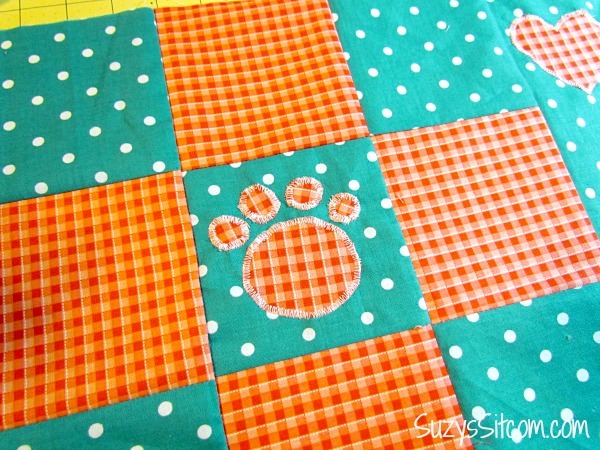 So let’s make some placemats! These directions are for one placemat. (I made contrasting ones for each dog). Begin with the rectangle meant as the pocket. 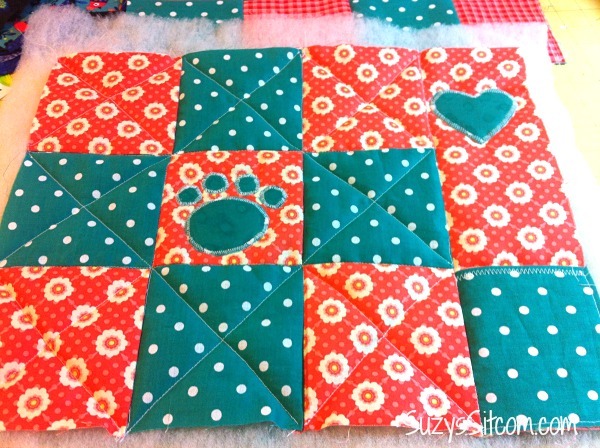 Fold over one of the 3.5″ sides and sew in place. (This is the top of the pocket). With wrong side of pocket against the right side of the 12.5″ x 3.5″ strip, sew the pocket in place with a 1/8″ seam. 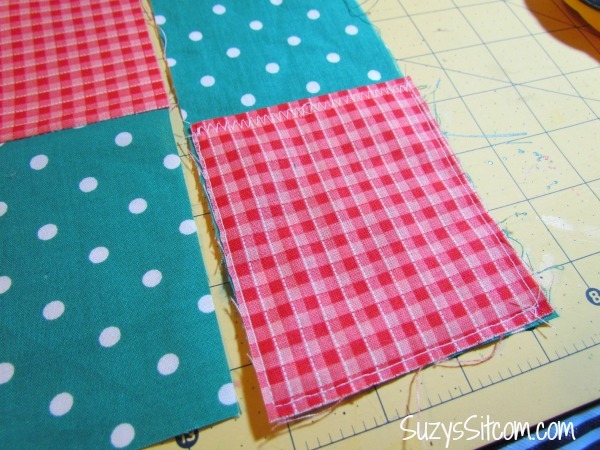 Sew each row of squares together using 1/4″ seams as shown. 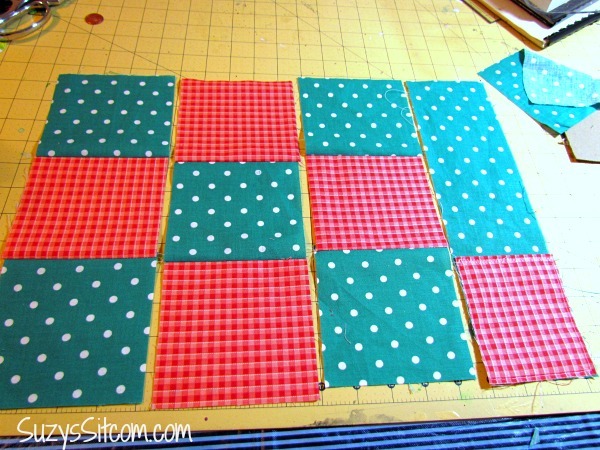 Then sew each row together to create the placemat top. 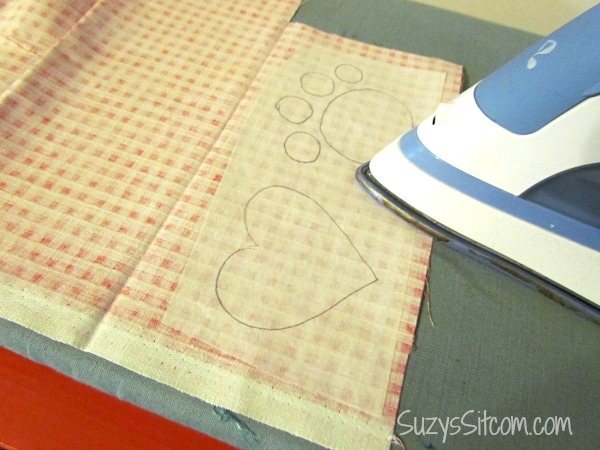 Draw a heart and a paw outline onto the smooth side of some fusible web. Choose fabric for your pieces and iron the fusible web, rough side down, onto the wrong side of the fabric. (IMPORTANT- be sure the smooth side is up and rough side is down. 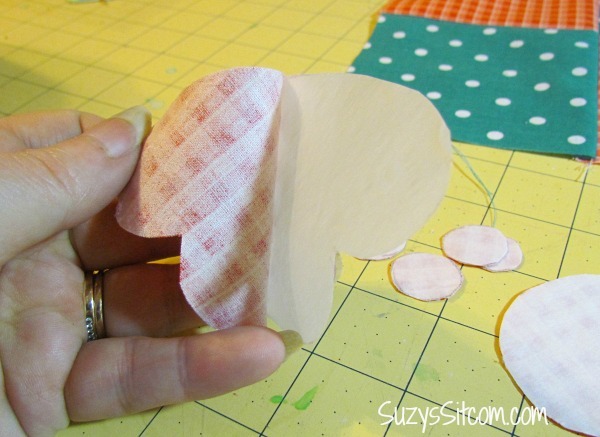 The rough side is adhesive which will stick to your fabric. You do not want it sticking to your iron). Cut out your pieces. Once they are all trimmed, you can peel off the fusible webbing, which will leave a layer of adhesive on the back side of your fabric. 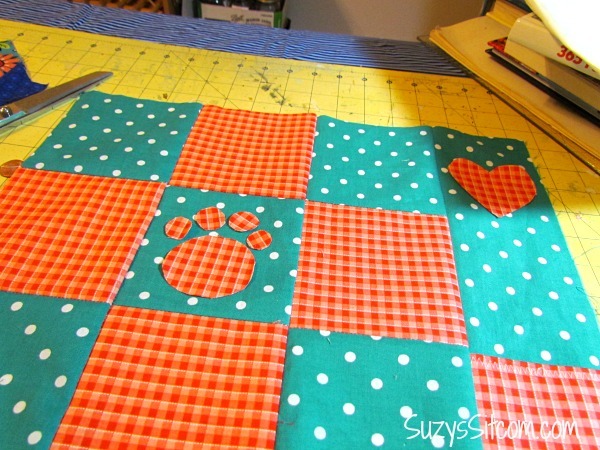 Lay your pieces down one by one, and iron them onto the fabric front. Once all the pieces are stitched down, it is time to quilt! Layer the fused fabric front, one layer of batting, The bottom layer will be the fabric back with the wrong side up. Pin the layers together. Sew all three layers together. 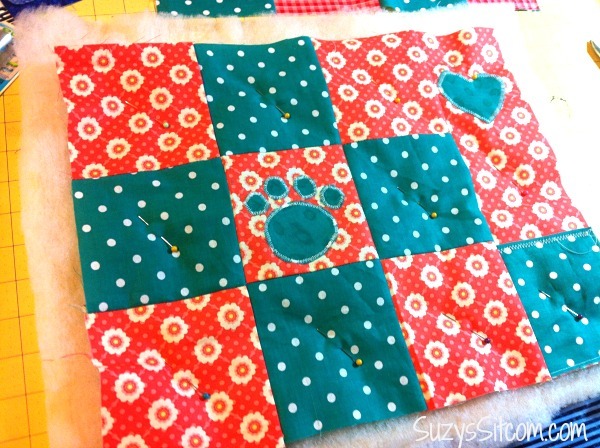 I followed along the sides of the squares and then stitched diagonally across all but the center square. I finished with binding. 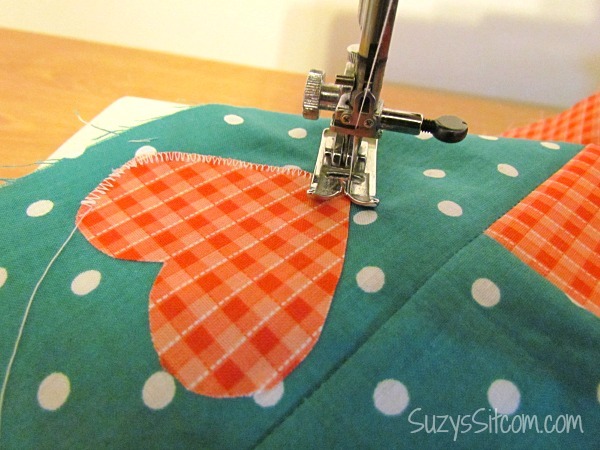 If you need a tutorial on binding, check out my quilt binding tutorial here. 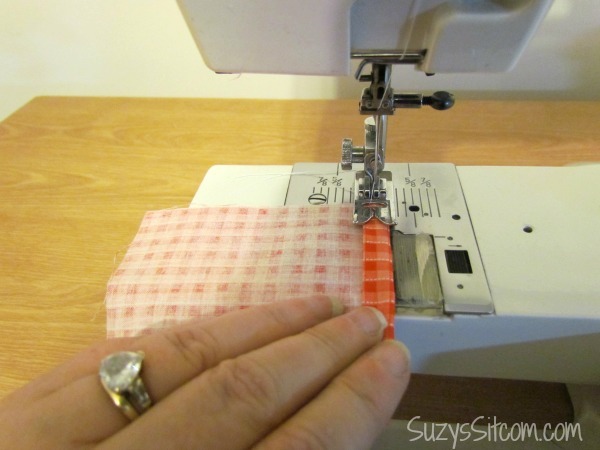 Or for another easy way to bind, this video on binding a quilt is a great help. I stuck a treat in the pocket to see how it worked. Faith said it works just fine! 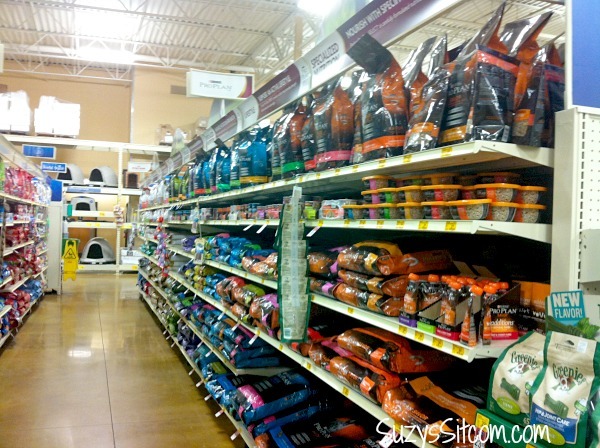 You can find Purina® Pro Plan® Dry Dog Food at your local PetSmart. Which by the way, is Faith’s favorite store. She loves the fact that she can come shopping with me, and gets to pick out a new toy when we go. PetSmart has most anything you could ever need to take care of your dog. It is a one stop shop! 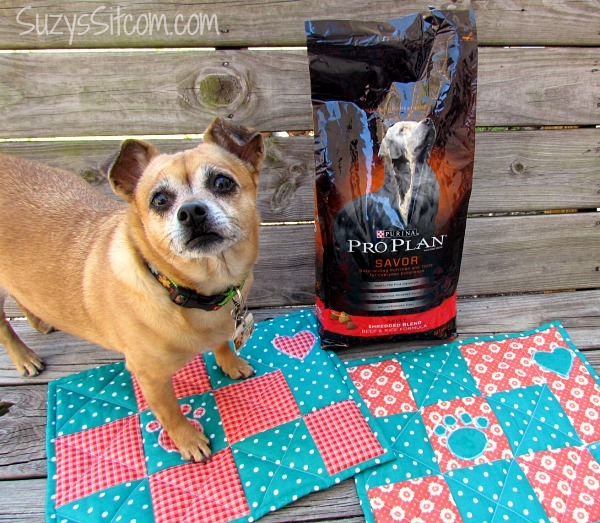 Would you like to try Purina® Pro Plan® Dry Dog Food for free? Visit the Purina® Pro Plan® MyPLAN website to get your dog’s MyPLAN recommendation and a rebate offer for a free bag of Purina® Pro Plan® Dry Dog Food (4-6lbs, up to $18.99)! That’s a heck of a deal! 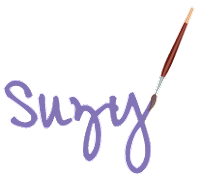 Do you love to create things for your pets? What have you made?